These little dumplings, made from a few staple Italian larder ingredients, are traditionally made in my home village of Minori on the feast day of the town’s patron saint. Mix the flour, ricotta, egg yolks, parmesan, nutmeg and seasoning together in a large bowl to form a soft, moist dough. Tip the mixture out onto a floured work surface and knead for 3-5 minutes. Roll the dough into a long, thin sausage shape, then cut into dumplings about 2cm/1in long. Cook the dumplings for 3-4 minutes in a large saucepan of salted boiling water. Meanwhile for the sauce, heat the olive oil in a frying pan and fry the garlic and chilli for one minute, then remove the pan from the heat and add the plum tomatoes. Return the pan to the heat, bring to the boil and simmer for five minutes. 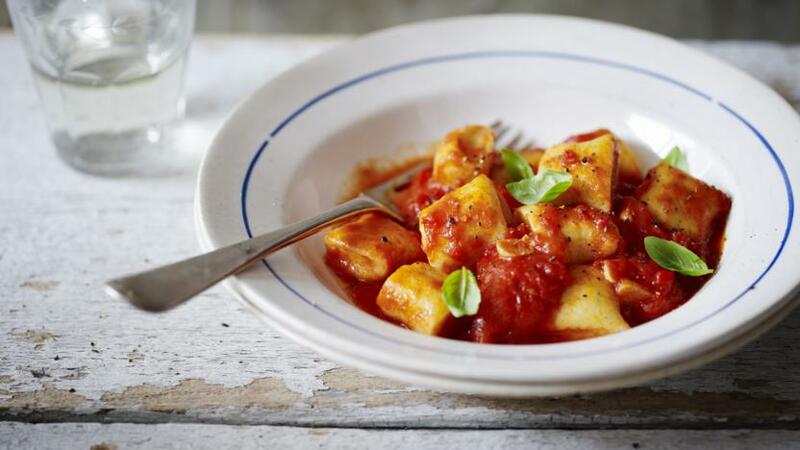 Remove the dumplings from the pan with a slotted spoon and add them to the tomato sauce. To serve, spoon the dumplings onto a serving plate and sprinkle over the basil leaves.